Accordingly, the provisions of 37 CFR 1.111, other than the provision in 37 CFR 1.111(a)(1) to “see . . . [37 CFR] 1.136 for time for reply to avoid abandonment”, apply to the response by a patent owner in a reexamination proceeding. The certificate of mailing and certificate of transmission procedures (37 CFR 1.8), and the Priority Mail Express® mailing procedure (37 CFR 1.10), may be used to file any response in a pending ex parte reexamination proceeding. If the patent owner fails to file a timely and appropriate response to any Office action, the prosecution of the reexamination proceeding will be terminated, unless the response is “not fully responsive” as defined in MPEP § 2266.01 or is an “informal submission” as defined in MPEP § 2266.02. After the prosecution of the proceeding is terminated, the Director will proceed to issue and publish a reexamination certificate. The patent owner in an ex parte reexamination proceeding must not file papers on behalf of a third party. 37 CFR 1.550(g). If a third party paper accompanies, or is submitted as part of a timely filed response, the response and the third party paper are considered to be an improper submission under 37 CFR 1.550(g), and the entire submission shall be returned to the patent owner, since the Office will not determine which portion of the submission is the third party paper. The third party paper will not be considered. The decision returning the improper response and the third party paper should provide an appropriate extension of time under 37 CFR 1.550(c) to refile the patent owner response without the third party paper. See MPEP § 2254 and § 2267. (C) notifying the patent owner that the response must be completed within the remaining period for response to the non-final Office action (or within any extension pursuant to 37 CFR 1.550(c)) to avoid termination of the prosecution of the proceeding under 37 CFR 1.550(d). This third alternative should only be used in the very unusual situation where there is sufficient time remaining in the period for response (including extensions under 37 CFR 1.550(c)), as is discussed below. 2. In bracket 3, if the reexamination was requested by a third party requester, the examiner should insert “ONE MONTH or thirty days, whichever is longer”. If the reexamination was requested by the patent owner, if the reexamination was ordered under 35 U.S.C. 257, or if it is a Director-ordered reexamination, the examiner should insert “TWO MONTHS”. In the very unusual situation where there is sufficient time remaining in the period for response (including extensions under 37 CFR 1.550(c)), the patent owner may simply be notified that the omission must be supplied within the remaining time period for response. This notification should be made, first by telephone, or by email if authorized by the patent owner and contact could not be made via telephone. An interview summary record (see MPEP § 2281) must be completed and entered into the file of the reexamination proceeding to provide a record of such notification. If the examiner is not successful in contacting the patent owner, the procedure set forth above should be followed. The practice of giving the patent owner a time period to supply an omission in a bona fide response (which is analogous to that set forth in 37 CFR 1.135(c) for an application) does not apply where there has been a deliberate omission of some necessary part of a complete response; rather, it is applicable only when the missing matter or lack of compliance is considered by the examiner as being “inadvertently omitted.” Once an inadvertent omission is brought to the attention of the patent owner, the question of inadvertence no longer exists. Therefore, a second Office action giving another new time period to supply the omission would not be appropriate. However, if patent owner’s response to the notification of the omission raises a different issue of a different inadvertently omitted matter, a second Office action may be given. Amendments after final rejection are approved for entry only if they place the proceeding in condition for issuance of a reexamination certificate or in better form for appeal. Otherwise, they are not approved for entry. See MPEP § 714.12 and § 714.13. Thus, an amendment after final rejection should be denied entry if some point necessary for a complete response under 37 CFR 1.113 was omitted, even where the omission was through an apparent oversight or inadvertence. Where a submission after final Office action (e.g., an amendment filed under 37 CFR 1.116) does not place the proceeding in condition for issuance of a reexamination certificate, the period for response continues to run until a response under 37 CFR 1.113 (i.e., a notice of appeal or an amendment that places the proceeding in condition for issuance of a reexamination certificate) is filed. Where a submission after appeal (e.g., an amendment filed under 37 CFR 41.33) does not place the proceeding in condition for issuance of a reexamination certificate, the period for filing an appeal brief continues to run until an appeal brief or an amendment that places the proceeding in condition for issuance of a reexamination certificate is filed. The nature of the omission is immaterial. The examiner cannot give the patent owner a time period to supply the omission. Where a submission made prior to final rejection is defective (informal), forms PTOL-475 and PTO-2311 are used to provide notification of the defects present in the submission. 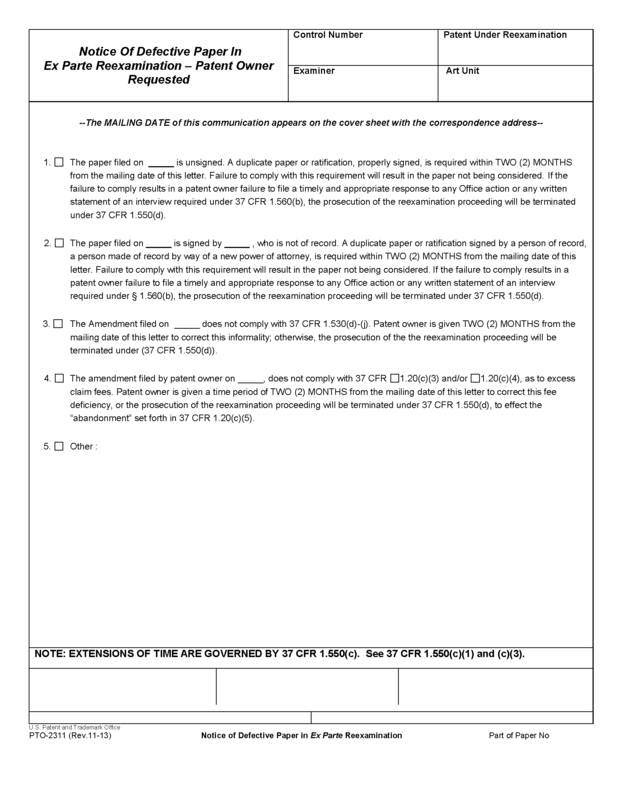 Form PTOL-475 provides notification of the defect(s) in a submission filed in a third-party requested ex parte reexamination, while form PTO-2311 provides notification of the defect(s) in a submission filed a in patent owner requested ex parte reexamination (including a reexamination ordered under 35 U.S.C. 257) or Director ordered ex parte reexamination. In many cases, it is only necessary to check the appropriate box on the form and fill in the blanks. 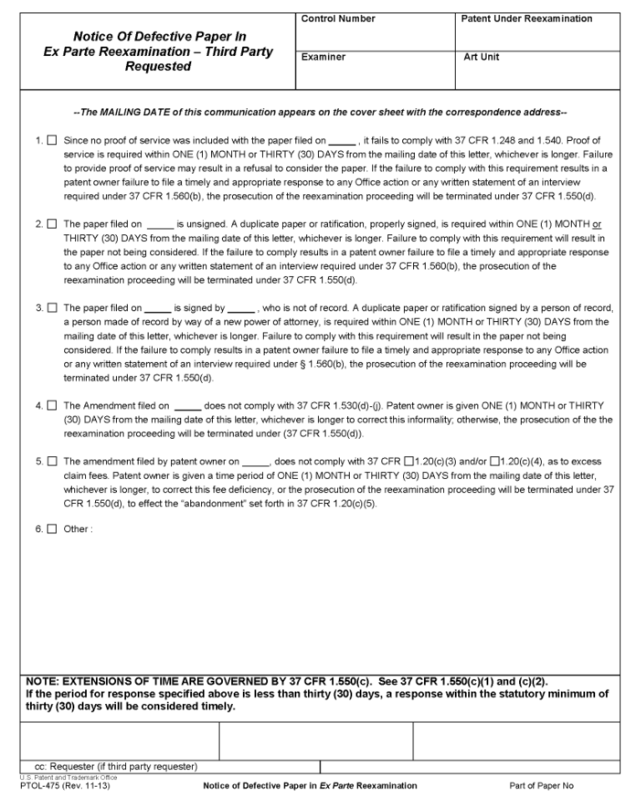 However, if the defect denoted by one of the entries on the appropriate form needs further clarification (such as the specifics of why the amendment does not comply with 37 CFR 1.530(d)-(j)), the additional information should be set forth on a separate sheet of paper which is then attached to the form. The defects identified above as (A) through (E) are specifically included in form PTOL-475 and PTO-2311, with the exception of (A), which only appears in form PTOL-475 (proof of service is inapplicable in patent owner requested reexaminations). If the submission contains a defect other than those specifically included on the form, the “other” box on the form is to be checked and the defect explained in the space provided for the explanation. For example, a response might be presented on easily erasable paper, and thus, a new submission would be needed. If no service was made, or the party making the submission cannot be contacted where an effort to do so was made, the submission is placed in the reexamination file and normally is not considered. Where the submission is not considered because of a service defect, the submission is added to the IFW file history as an unentered paper with a “N/E” notation, along with a brief annotation as to why the paper is not entered. The submission itself shall be annotated with “no service,” which also can be crossed through if the appropriate service is later made.